Leah Amanda Webb-Gardner-Walker, passed away on Tuesday, March 26, 2019, surrounded by her loving family. “Amanda” was born in Macon, Miss., on March 25, 1928, to her parents, the late Enoch and Amanda (Mandie) Webb. She was the last survivor of 18 children of the Webb Family. She attended local schools in Macon. In May, 1944 she was married to Thomas Gardner. They were blessed with seven children, five sons and two daughters. In 1966, “Amanda” graduated from Harrison High School “night school” receiving her high school diploma. She was Valedictorian of her class and graduated the same day as her daughter Priscilla graduated from Harrison High School. She was later hired to work at Blytheville Air Force Base as one of the first group of Black employees and later in her career she worked as the first Black female mail carrier at the Blytheville Post Office where she retired in 1988. While working for the Post Office, Amanda purchased a small grocery store on Mchaney Road as a family business and was a community figure where locals could gather and purchase small lunches and dinners. She was preceded in death by her precious children, Thomas Gardner, Jr, William Gardner, Arthur Glenn Gardner and Jimmie Gardner. 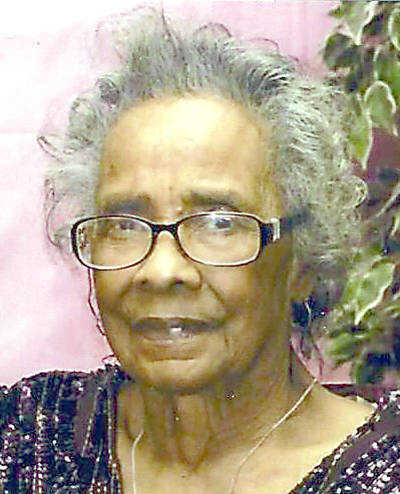 “Miss Amanda”, “Granny”, "Sis Walker”, “Miss Leah” leaves to celebrate her life her children, Priscilla Ann Russell (Indianapolis), Dorothy Davis and James Douglas Gardner (Blytheville), over 70 grandchildren, great-grandchildren, great-great-grandchildren, nieces, nephews and other relatives and friends. Special thank yous to the loving members of the Northside Church of Christ, Stonebridge Senior Living Center, Heritage Nursing and Rehab Center and the Southside Church of Christ. Visitation was 11 a.m. followed by service at noon on Saturday, March 30, at Northside Church of Christ located on N. 6th Street in Blytheville. Romans 8:28 And we know that all things work together for good to them that are called according to his purpose.